AXO's new FATSO range, follows an extensive 3 year design, prototype and test program and are the most efficient, robust and maintenance friendly Shredders in the market today. The FATSO range lifts the bar in Shredder design, with many features new to the industry. "HH" indicates Hard-Drive specific models with replaceable concave Hard-Heads. 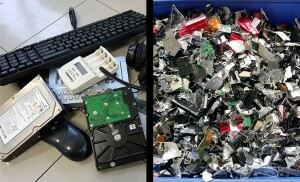 "XH" indicates cutter-shaft material specific for hard-drives and e-waste. 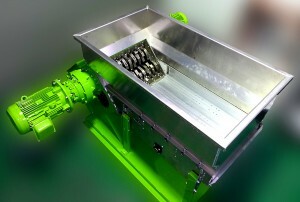 The resulting Fatso design is very different from previous AXO shredder models, but the core AXO focus of low-speed high-torque remains. Low speed, in plant based and mobile shredding applications reduces the amount of dust generated, and also the risk of fire. 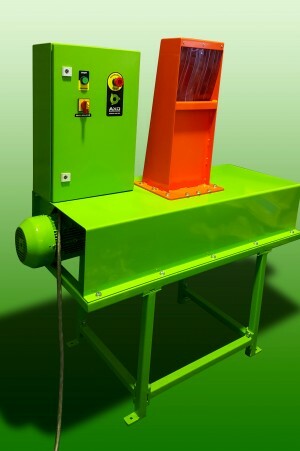 The Hard-Head system was developed by AXO to lower the cost of ownership of our shredders. 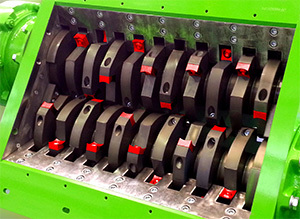 The Hard-Heads shown in red are attached to each cutter, fixed from the rear with a capscrew. Because of this they can only be fitted to cutter widths above 20mm. The Hard-Heads can be removed and rotated after the leading edge has worn. They can be replaced while the cutter shafts are still in the shredder block. The Hard-Head material and treatment process is specifically developed for AXO to increase cutter life and reduce overall wear cost to the customer. Hard-Heads stay sharper and have a convex face with sharp points, so they keep the shredder grabbing and pulling in more material for a longer time. It's ideal for hard to grab applications like plastics, drums, paper roll cores etc. Shredders with Hard-Heads are also ideally suited to higher wear applications such as paper pre-shredding, biomass, and multi-stream waste. 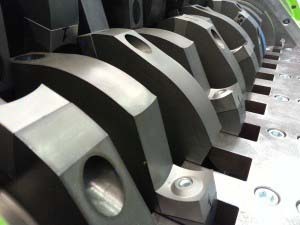 Slot feed for product up to 240mm wide x 50mm thick. Available in plant/factory based installations using either single or three phase power connections. Throughput figures vary according to feed method product type being shredded and other processing equipment. AXO does not guarantee throughput rates at any particular plant. Throughput figures shown are based on actual throughput rates achieved in the field however variable factors mean these rates cannot always be sustained.